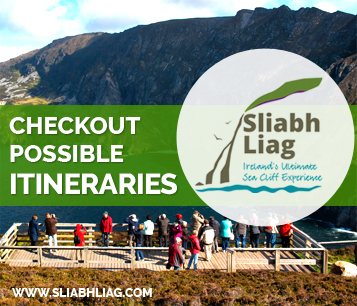 Sliabh Liag are known as the highest accessible sea cliffs in Europe reaching a height of 1,972 feet/601 meters, is almost twice as high as the Eiffel Tower in Paris and nearly three times the height of the famous Cliffs of Moher in County Clare. 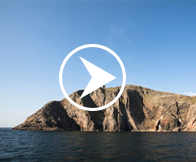 Visiting Sliabh Liag will surely be an experience you will never forget on the Wild Atlantic Way. Sliabh Liag cliffs can be found just outside Teelin, which is in Donegal bay 12 miles from Killybegs and a 1.5 hour drive from Donegal Town. Continue along this road for a distance of 5 km to the Sliabh Liag Cliffs.